The General item of the System Profile Preferences dialog box allows you to configure basic properties of the System Profile, such as used technologies; and manage configurations. Name A system-wide unique name of the System Profile. It is also used for storing the System Profile on the AppMon Server as an XML file. Description Descriptive text of the System Profile. For documentation purposes only. Capture Events Toggles event capturing for all Agents of this System Profile. Performance Warehouse Access Defines if the System Profile has access to the Performance Warehouse. Enabling Performance Warehouse access stores data captured by Agents. PureLytics Stream Enables or disables the PureLytics Stream. This feature lets you send real time UEM data from the AppMon Server to an external data source like Elasticsearch so you can you leverage UEM data as part of big data analysis. See PureLytics Stream for more information. See Configure Realtime Streaming to learn how to stream UEM data to an Elasticsearch instance. Technologies not supported by the System Profile can&apos;t have Sensor Rules. Configurations Create and edit System Profile configurations. See the Configurations section below for more information. Configurations allow you to keep several different Sensor Rules sets in one System Profile. 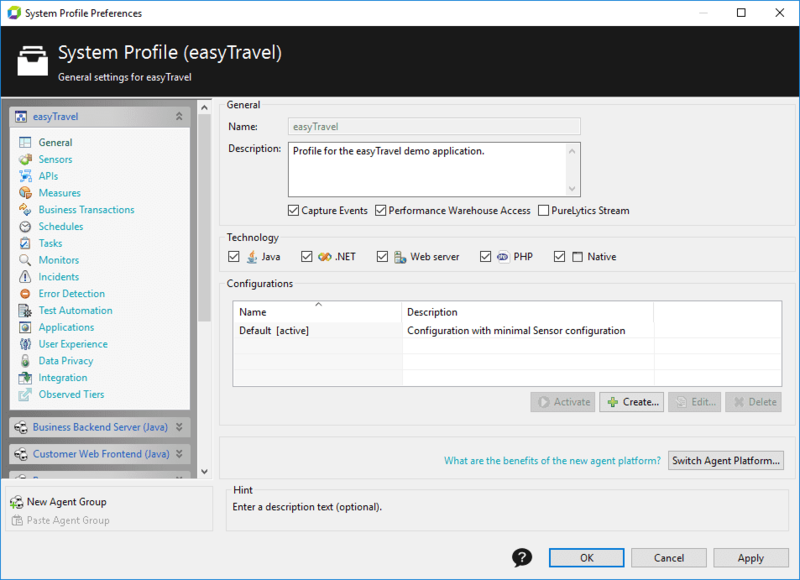 Everything you configure at the Sensors item of the System Profile Preferences dialog box are stored in the active configuration. To activate a configuration, just select it and click Activate. There is always exactly one configuration active inside a System Profile, so the previous one is deactivated automatically. See Sensor Configuration for information about configuring Sensor Rules.